A three dimensional cutting machine, manufacturer rated for products input sized up to 5.5 inches (140mm) in any dimension. Manufacturer recommends for uniform dices, strips, and slices from a variety of soft ripe fruits and brittle root vegetables, such as potatoes, beets, lettuce, cabbage, broccoli, cauliflower, sweet potatoes, squash, carrots, mushrooms, turnips, canteloupe, endive, tomatoes, cucumbers, horseradish, apples grapefruit, citrus peel, papaya, pineapple, peaches, celery, rutabagas, melon rind, and many other foods; producing clean, uniform, high-quality tons-per-our output. 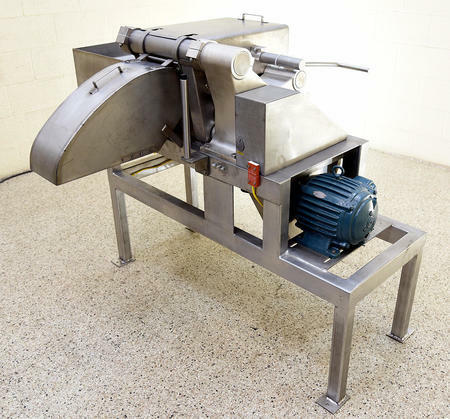 By removing the crosscut knife spindle and / or the circular knife spindle(s), the Urschel H dicer can also cut strip cuts (two-dimensional cuts) such as for french fries, and slices (single dimensional cut). USDA sanitary model designation, with food grade stainless steel construction including spindle arms, guards, shrouds and tubular stainless steel frame. Standard 2 HP 208/230 volt 3 phase drive. This page contains a single entry by Michael C. Shults, Alard Equipment Corp published on November 17, 2018 11:37 AM. 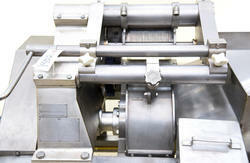 Food METAL DETECTOR with CONVEYOR, 13x12, stainless steel, Y3951 was the previous entry in this blog. HEAT INDUCTION SEALING MACHINE, 1kw or 2kw, Y3921 is the next entry in this blog.